UMBC is at the center of Maryland’s growing efforts to harness the energy of the wind. Ocean City is the Maryland destination most associated with the summer. But some- day the resort may also be known for a nearby wind farm that could help the state put a dent in its greenhouse gas emissions and the rising costs of generating power. Both this summer and last summer, UMBC scientists, using a remote sensing technology called LIDAR (Light Detection and Ranging), have been helping the state of Maryland in wind resource assessment efforts to develop the state’s wind energy farms in the Atlantic Ocean near Ocean City. The project is part of a plan envisioned by Maryland’s legislature in a new law – the Maryland Offshore Wind Energy Act – passed in the 2013 legislative session and signed by Governor Martin O’Malley. The legislation calls for the establishment of a facility at least 10 nautical miles off the state’s coastline that would eventually produce as much as 500 megawatts of power for the state. Researchers at UMBC were called in to enhance understanding of the role mid-Atlantic weather patterns have on seasonal and temporal wind resource variability off the coast of Maryland, which will ultimately lead to better estimation and optimal development strategies for offshore wind energy production. The first stage of development for Maryland’s wind energy area will be a 200-megawatt wind farm, with potential construction of at least 40 wind turbines initially, with the potential for more than 300 once fully developed. Knowing the wind variability over a large wind farm is just the latest use for the scanning Doppler Wind LIDAR at UMBC, a technology like radar but one that uses laser light instead of sound waves. LIDAR can make exquisite 3-D images by bouncing off things as small as air particles. The UMBC team used Doppler Wind LIDAR last summer to see how much wind is available off of Ocean City for the wind farm. Wind energy is booming all over the United States. But it has yet to come to full strength in Maryland. Although it remains behind Europe in wind energy (which accounts for 13 percent of that continent’s energy) the United States now gets almost 4 percent of its electricity from wind turbines – enough to power 15 million homes. The U.S. Department of Energy projects that this figure will rise to 20 percent by the year 2030. States in the Midwest, which have the advantage of wind constantly raking the prairie, already generate substantial amounts of electricity from turbines. Two states, South Dakota and Iowa, generate more than 25 percent of their electricity from the wind. Six states get more than 15 percent; nine get better than 10 percent. Another key to the rise of wind energy is that the price of wind-generated electricity has fallen 43 percent in the last four years, according to the AWEA U.S. Wind Industry Annual Market Report Year Ending 2013. More than 61,000 turbines have already been built – a boom spurred by the federal Production Tax Credit Act, which gives 2.3 cents of tax relief per kilowatt hour for the first 10 years of a turbine’s life. Maryland ranks only 32nd in the nation in wind-generated electricity. At present, Maryland gets only 0.9 percent of its electricity from the wind, some 120 megawatts, or enough to power 29,000 homes. The state has 51 turbines in four working projects. The Maryland Renewable Portfolio Standard requires the state get 20 percent of its energy from renewable resources like wind by 2022. Energy efficiency is only one of the tangible benefits that ramping up the state’s wind-power infrastructure will bring. The Department of Energy estimates that a large facility (200 megawatts) would reduce emissions of carbon dioxide, a greenhouse gas, by more than 378,000 tons per year. Such a plant would be “green” in other ways, creating almost 850 manufacturing and construction jobs over five years and 160 permanent jobs to keep it running, Maryland’s Department of Business & Economic Development projects that would generate $1.3 billion over five years, including $5.6 million in taxes. Andrew Gohn, senior clean energy program manager at the Maryland Energy Administration (MEA), says when he took his job five years ago Maryland produced no wind energy. It wasn’t clear, he says, that Maryland had the winds that would make wind energy viable. “Our understanding of the wind evolved,” Gohn says. Part of that understanding is the role that offshore winds will play for coastal states like Maryland. Offshore wind energy is common in Europe. Europe now gets 8 percent of its electricity from offshore wind farms, with countries like Denmark, Britain and the Netherlands leading the way. By 2020, according to the European Wind Energy Association, a quarter of European power will be generated by offshore turbines. There are no offshore facilities yet in the United States, although 18 are planned, including the Maryland project. UMBC and its LIDAR lab are key players in charting a course for offshore wind power. Ruben Delgado, a native of Puerto Rico and an assistant research scientist at UMBC’s Joint Center for Earth Systems Technology (JCET), headed the university’s field team. Delgado has used LIDAR technology to measure particles in the upper atmosphere in other experiments, so he had considerable experience using laser remote sensing. His team now had the task of discovering whether there was enough wind offshore to make a Maryland wind farm economically viable. “We are using lasers to measure the speed of aerosol particles and dust particles [in the air], and from there we can infer the wind velocity, speed and direction, and derive atmospheric parameters such as turbulence and wind shear,” says Delgado. Delgado and a team of UMBC undergraduate students were embedded with employees of the St. Petersburg, Fla., firm Coastal Planning & Engineering Inc. on a chartered boat (the Scarlett Isabella) off the Maryland coast last summer. The ship sailed a grid pattern – similar to what ships do in rescue searches – to conduct the research, which took place near the coast of Ocean City. The team explored 94-square nautical miles, ranging from 10 nautical miles from Ocean City to as far away as 30. The voyages lasted over a two-month period, with researchers out on the water in two-week shifts. The time spent on the boat was by no means exciting, but the data the scientists and other researchers gathered was important. Besides the UMBC LIDAR, the ship carried seismic and magnetic detection gear to survey the seabed, which researchers were measuring to see whether it would support wind turbine construction. Alexandra St. Pé ’13, M.S. geography and environmental systems, is a current Ph.D. student in the department involved with the project. She adds that the researchers didn’t just mind and monitor the computers for the research. They also had to keep an eye out with binoculars for marine wildlife like whales, dolphins, and turtles. Under federal law, the ship – or any vessel – is forbidden from going within 500 meters (around 1,500 feet) from certain protected species. The presence of dolphins also required researchers to turn down the sonar used for exploring to protect the mammals. Lookouts also watched for seabirds and bats. At one time or another, the researchers spotted all the above along with some sharks and tuna. They had to cease operations six times during the summer because of the presence of marine animals. For energy purposes wind must be measured the first 250 meters above the surface, where Delgado aimed the LIDAR. One of the surprises, observes St. Pé, was the strong summertime wind resource offshore. The researchers expected to find, for instance, less wind offshore during the summer due to quiescent, hot weather patterns typical for the region. Low wind speeds during the summer would be a concern due to peak electricity demand from air conditioners running in the Maryland heat. It was important to get the wind speed right because the power that can be harnessed by wind turbines is a function of the cube of the average wind speed. Wind turbines collect 20 to 40 percent of the energy in the wind. Changes in wind velocity help make them more efficient, meaning if the wind doubles in speed, the energy output goes up eight times. Wind power seems to be a perfect solution to help boost clean energy in Maryland. But there are uncertainties. Conservationists worry about the impact wind farms would have on the marine life that the researchers so closely monitored. Others complain that turbines are an eyesore and make too much noise. The planned offshore facility would be over the horizon – out of sight and out of hearing. But there has been legislative pushback on the proximity of some land-based wind projects to the Patuxent River Naval Air Base in southern Maryland. Skeptics about that project, including U.S. Representative and House Minority Whip Steny Hoyer (Md., 5th District), think the turbines would interfere with radar testing at Patuxent and force the base to close. Such concerns don’t affect the offshore Ocean City project, but they do demonstrate the complexity involved with winning public support of what might seem a simple technology. But for a long time it was economics, not aesthetics or wildlife concerns, that helped block wind power as a viable option. Coal and gas remained cheaper. Not anymore. In some places, wind energy now costs about the same as natural gas, thanks to innovations like new kinds of turbines and blades. In Australia, it’s cheaper than both coal and natural gas, and it’s competitive to coal in India. Since the 1990s, the size of rotors has increased by 90 percent and the hubs of the rotors are now 45 percent higher, some as high as 100 meters (330 feet). They generate 17 times more power than those used 20 years ago. In some areas of the United States – west Texas, for instance – the price of wind energy is down to less than two cents a kilowatt hour. In some places, according to Gohn of the MEA, which is in charge of the project, wind energy has reached “grid parity.” In the mid-Atlantic states it is around 6-1/2 to 8-1/2 cents, close to being competitive. Wind farms, unlike coal or natural gas-generating facilities, are capital-intensive—the greatest cost is in constructing the wind farm, something like 75 percent of the total cost. Since it does not depend on a commodity to run it – coal or gas – and gets its power for free, a wind farm is cheap to operate. The “fuel” to run it also is stable, which energy companies like. St. Pé, who is assisting Delgado, says there is room for two leases – perhaps for two different developers – in the offshore area that UMBC researchers canvassed. Those farms could eventually produce 400 to 800 megawatts apiece, creating a total of 800 to 1,600 megawatts. Two hundred megawatts would power a third to a half of the needs of the Eastern Shore. And local power companies are legally obliged to buy the output. The developers would run the farm and sell their energy to power companies, which are obliged to buy it and balance it with the energy produced by the fossil-fuel generators in the grid, which has limited capacity. Delgado says that UMBC will be back at Ocean City again this year. This time they’ll be deploying a scanning Doppler Wind LIDAR instrument at Ocean City. He says that the data they obtain will provide even more evidence to help build Maryland’s wind power future. View How-To videos, interview extras and more! Be Our Next Roving Retriever! Traveling the world? 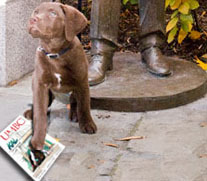 Send us a photo of yourself with your copy of UMBC Magazine, and we'll share it on our Facebook page!